You have lost your cube or office space. If you haven’t, you will be very soon. Why? Because open workplaces are the future. They encourage collaboration and transparency, and, well… they are the best. Not convinced? Will the idea of a private workspace soon become extinct, with cubicles becoming merely an exhibit in museums highlighting a lost work practice? Or is there a need to strike a balance between the open workplace and the need of employees to perform focused work in a cognitively demanding world? Let’s take a look at what you need to know to be a player in this initiative at your organization. Future of the Workspace: Open Spaces, Work from Home? Based on research from IFMA (International Facilities Management Association) over 70% of employees work in an open environment, and the dedicated space for employees is on a rapid decline (from 225 sq. ft. in 2010 to 190 sq. ft. in 2013). While many proponents of open work environments tout the benefits of learning and culture, many organizations are designing their workplaces with the goals of reducing costs (real estate, energy, furniture). How did we get here? Time to look to the past to understand “work”. The beginnings of most modern economies started with home based craftsman occupations. Think of a butcher, a baker and a blacksmith (c’mon – candlestick maker!). The jobs had high task autonomy and low cognitive demand. With industrial revolutions we move to factory or office based work (low task autonomy and low cognitive demand). Most economies have moved to a modern occupational setting where there are increasingly skilled employees who are industrial or office based, having moderate task autonomy and moderate cognitive demand. The next level? The digital occupation. Highly skilled “free agent” knowledge workers who are information and team based, with moderate to high task autonomy and high cognitive demand. So what does this history lesson have to do with the workplace of the future? Employees now have more freedom with how they spend their time (task autonomy), but more mental pressure with constant deadlines and pushes for innovation, problem solving and knowledge acquisition (cognitive demand). This introduces one of the first challenges with open workspaces. Balancing the opportunity to collaborate with the need to eliminate distractions. One solution is to go back to our past, homeworking. While this working environment has shown increases of productivity by as much as 20%, due to a reduced feeling of observation, most organizations have failed to move their ergonomics programs to the home office. This leaves many home workers with increased discomfort, eliminating or reducing any potential productivity advantages. Now that we know the employee journey, we can begin to focus on the present and consider the implications of “place”. Most implementations of open workplaces are taking on a similar path. They start with a space use survey to understand how groups use their space. However, many of these surveys focus more on amenities than work – if you build it (comfortable and cool), they will come. The rest of the surveys turn to a focus on work situations (i.e. meetings, private time, collaboration and storage). A typical result is then a space plan that tries to accommodate as much as possible in the minimal amount of space. While the aesthetics can be inviting and even inspiring, the core components have become quite predictable (open working desks, huddle/private rooms-phone booths, meeting rooms and some café/lounge area for collaboration). These plans consider situations – how much time do you spend in meetings, private phone calls, working at your desk? The missing element is the study of how these knowledge workers move from information to deliverable. This is where the present focus for designing the workplace needs to consider personas. Some may think of persona as a character from the arts, or user group (marketing), and even the method for creating use cases in software design. In our case, we simply want to categorize types of workers. When we use a persona, we want to focus on empathy, understanding motivations/perspectives/issues, behavior patterns, identify engagement options, and anticipate and overcome objections. 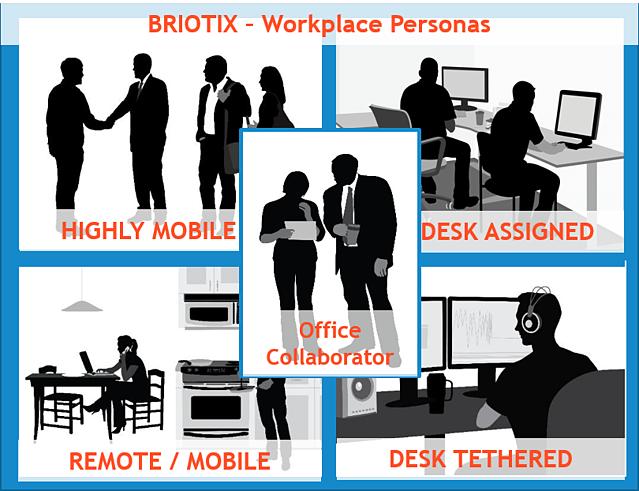 Briotix uses 5 main personas when assisting clients with workplace planning. Most open workplaces cannot easily accommodate those that are desk tethered (i.e. call center or surveillance positions) or desk assigned (employees who keep the same desk each day), so we will not focus on these personas. However, consider the “highly mobile” persona. If the highly mobile worker is given an assignment that requires collaboration and delivery of content, where do they start? Do they go to the open work area and start a conversation (potentially interrupting others), or do they schedule a meeting in a room? What do they do when they have to focus on delivery? Do they go the work area, and battle with distractions, do they use a private room? These questions illustrate the gap between open space plans and the knowledge worker. Not only are these scenarios missing from the plan, they can differ with each work group that has different working protocols, technology and micro cultures. Once these personas are integrated into the plan, the organization has to consider how it can help employees learn these new behaviors. Most organizations role out a general orientation to the new workplace. However, lacking the persona based use cases, employees quickly begin to develop rules and practices that were never intended for the space. Considering the challenges presented by the digital knowledge worker, and the gaps that exist with open workplace plans that don’t accommodate persona thinking and behavior change, what does the future hold for the results of the future workplace? The answer is productivity. While many of you managing an ergonomics program may still think of productivity with knowledge workers as the “holy grail”, and only something that can be applied in industrial settings, there is hope. The following image looks at data that can be measured to demonstrate both task performance and knowledge performance. Some of these items (error rates) are easy to measure with tools that you can implement – see www.efficiencysoftware.com. Other measures may be already implemented at your organization (employee engagement). The bottom line is that the tide driving the workplace of the future is one of reduced costs. While some progressive organizations aspire for the additional benefits of these “places”, the lack of measurement on the gaps will keep employees from performing at their best. To deliver a durable workplace of the future and a positive impact, the typical players and HR teams who are creating these plans need the experience and perspective of those involved in ergonomics. This article is for those that will fight for a seat at the table, hopefully you! If you have questions or want to discuss further, we welcome the conversation (contact us). See you in the future!